Wire or wireless, you can easily connect with the box at any time, then just enjoy a music trip! With the built-in microphone you can answer the call handsfree! LED display: when charging, bright red. fully charged, red light turns off. 【Advanced Wireless Technology]】: Using Bluetooth 4.2 version, the effective distance of 10 meters or more for the market mainstream mobile phones, tablets, laptops, television and most other Wireless-specific electronic devices. 【Surround Sound】: Built-in double horn, with DSP bass technology, loud volume, bass boost, with 20W high-performance, you can experience your music in full-bodied stereo, perfect for home, party, picnic or other activities, take it with you to listen to music anytime, anywhere. 【Home TV stereo】: The long fashion appearance, just match the shape of the TV, allows you to experience the shocking sound effects and spend the warm time of your home theater with your family. 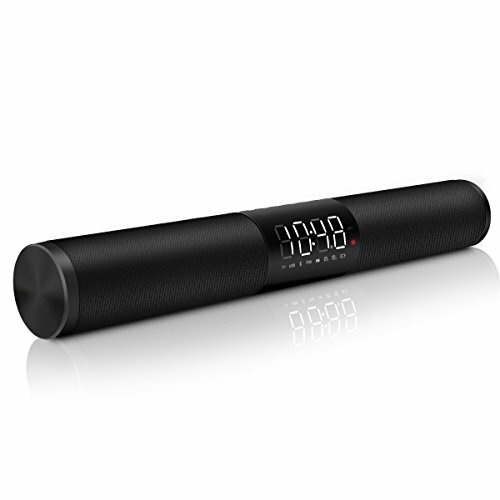 【Standby Time】: Built-in 2200mAh rechargeable lithium-ion batteries, more durable, you can enjoy up to 8 hours of your favorite music, 10 hours of talking time. Even long distance movement does not need to worry about the amount of electricity to fill enough, standby time for up to 5 days.